I lost my mum on 21st December 1995. I was 8-years-old, and my sister was 5. I hate that term, lost. I didn’t lose her. She was ripped from my life after a battle with ovarian cancer. Hysterectomy. Chemotherapy. Hospice. She fought with humour, grace, and style. No NHS wig for her, she rocked a patterned head scarf and exotic earrings and was amazing. After 20 years of being motherless, I’d grown used to it. I will never say that time heals, but birthdays passed and anniversaries were remembered – the dates etched into my memory forever more. Mother’s day usually left me sobbing in a cold, windy cemetery as I left yellow roses at her grave. The day I got my exam results; passing my driving test; the dance shows; the day I landed a promotion. All silently marked in my mind by the absence of the most beautiful woman with the warmest smile and the hope she would be proud of what I had achieved. I had never planned to become a mother. I’d only known that love for such a short while; I didn’t think I was capable of providing it. 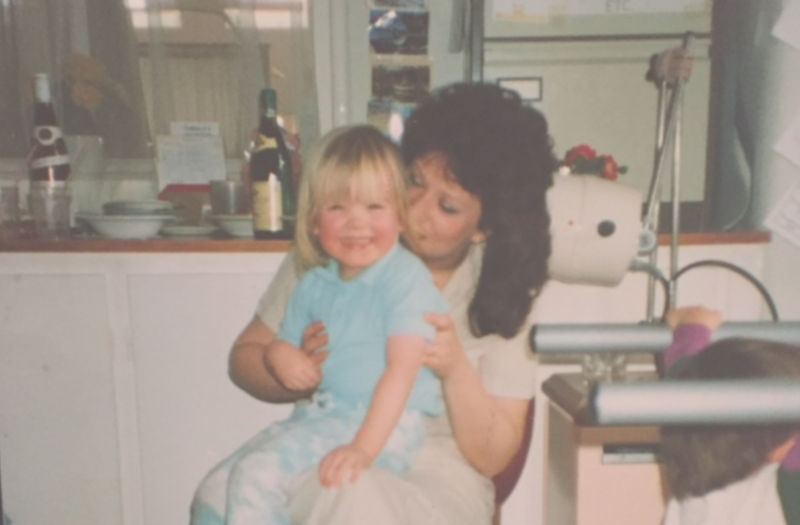 I think living so long without really knowing the nurturing and affection of a motherly bond made it feel alien to me, and yet my missing mother was up on such a pedestal that there was no way I could compare. The gap between my lowly Earth-bound self and the angelic matriarch of my memories and recounted family stories was just too great. Motherhood was not for me. Then I found out I was expecting my baby. It was like she’d just been taken from me, then and there. I felt the same panic of my fresh, childhood grief hit me. The same way it did at her wake when I ran room to room, searching for a person who could anchor me in this storm I found myself in. How could I cope? Who would help me? Who on earth would I turn to, to learn how to do this, to be the one thing I’d lived most of my life without: a mother. Pregnancy was lonely for me. I spent a lot of time feeling very frightened about what was to come. I hid my anxiety and probable pre-natal depression – you can’t not be happy about having a baby. You can’t admit you are utterly terrified that you will fail. Every woman wants to be a mother. You can’t confide any of this to anyone because there is no one on this planet who loves you enough to hear these things come out of your mouth and still be there for you. There were times I genuinely thought I could not go through with the pregnancy, or that I’d have to run away once he was born. I remember phoning the hospital to book an appointment with the midwives. The lady I spoke with on the phone paused when she heard my name. She’d known my mum. They’d worked together years before and had been friends. She shared her memories of mum as I broke down on the phone. Tears flowed, but so did a feeling of relief. It felt like a sign that she was there with me, she knew. After that call, I loved going to that hospital for my antenatal visits – I always left with my eyes stinging with tears but a heart full of hope. My son was born on the 16th June 2015. It’s a cliché, but it’s like a magic wand was waved. My fears evaporated when he was placed in my arms. The pieces of my life fell into place. Old rifts were healed and new bonds were formed. I finally feel complete, knowing the love I feel for Ted was once felt for me. Holding him in the middle of the night, singing him the same lullaby that was sung by my mother is an indescribable feeling. It’s like a direct connection to all the women who came before me and to all those who will for generations to come. And although becoming a mother myself has healed wounds, there are still moments of sadness that hit like a ton of bricks. Unexpected blows that take the wind from my sails. I was sat in a restaurant with my husband enjoying lunch and watched a woman and her daughter walk in pushing a brand new buggy. When my son’s first nursery pictures were taken and I ordered a portrait for each of his grandparents except for his Nana Jackie. Now he’s old to enough to look at photos and recognise his family, but his face draws a blank when he sees my mum. The 3am worries that I, too, might get ill and not be here to look after Ted. And how my mother in law can describe how my son reminds her of my husband, because I will never hear how he resembles me and the unspoken joy that brings. No one remembers at what age I walked, the foods I loved or my first word. But I will imagine it was Mama. Love you always. Rebecca is 29-years-old and lives in Wiltshire with her husband Ben, and their son, Ted, who is almost 2.